Like the game we learned when we were young, the design features the familiar ‘x’s and ‘o’s. The border carries through the theme by showing the ‘x’s and ‘o’s in each color used in the main design. 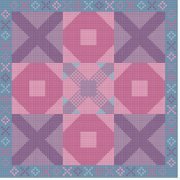 All whole stitches are used in this design that could be used as a quilt block with or without the border.